Will you exchange money before you travel or use your card to get money out of the ATM when you arrive? Do your research before you travel to ensure you get the best exchange rate, many currency exchange places will also buy back your foreign currency when you return home, for free. 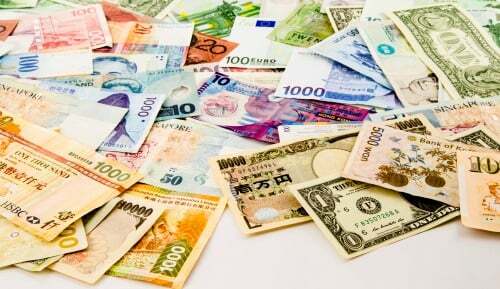 Using ATM’s abroad generally always incurs fees. You could pay extra fees of £2.50/$5 to £5/$10 each time you withdraw money. Check to see if your bank is part of a network with international partners to avoid these fees. Some credit cards also charge a foreign transaction fee of up to 3% for charges made abroad so make sure you know the associated costs before you travel. Additional tax and tourist tax occurs in Europe and USA in particular. In Venice for example, tourist tax is charged by hotels to all tourist and is a few Pounds/Dollars a day. Destinations like USA charge tax on pretty much anything purchased so you think you know the total amount – and then comes the tax. This can come as a nasty shock if you are not aware of it. When you arrive in the USA, speak to a local or somebody who works at the hotel you’re staying at about what extra charges you may get when buying anything. You might not plan on using your phone but you never know when you might need it so it’s best to take precautions, just in case. What if you arrive and there are no taxis, what if you get hopelessly lost and no one speaks your language. You can save yourself a lot of time and effort of you could call a cab or look at a map. Take a global SIM card for cheap calls and data, and free roaming, that way you can ensure if you need to use your phone you won’t be bit with a bill that costs more than your entire holiday. Room service and minibars are an expensive way of having the luxury of food and drink in your hotel room, some hotels have sensors in the fridge so if you even move anything you will be charged for it. Make sure you always have a few snacks and a bottle of water (bought from the local store) in your room so you don’t get a massive mini bar bill after your two week stay! How will you get to and from the airport? It’s not always most economical to drive to the airport and park for two weeks, it may be cheaper to get a taxi or even a coach or train. Have a look at the options to see what works best and keep in mind the times of your flights – the last thing you want is to land back in your country or residence and not have a way of getting home! You also need a plan of how to will get from the airport to your hotel when you arrive at your destination. Check with the hotel the best way of doing this before your travel. Remember, you will also need to get from the hotel to the airport when you leave. Rather than pay a small fortune in extra baggage because you accidently over packed or bought too many souvenirs, invest in a luggage scale so you know your baggage is within the allowed limits. Luggage scales are really cheap and can save you quite substantially in over weight baggage costs. Depending on what country you are in, the rules relating to tipping are different and before you know it you could have spent a small fortune on service charges. Speaking to a local or somebody who works at your hotel will give you valuable advice about how much to tip and when to do so. You could even check in a guidebook before you travel to make sure you know what the etiquette is. Is Wi-Fi included in your hotel for free or is there a daily charge? You should find out this information before you travel so you can make alternative arrangements is necessary – let’s face it, none of us can deal without internet for a week! If Wi-Fi isn’t included it might be more economical to get a pocket Wi-Fi to take with you so you can get online wherever you are as some hotels charge a fortune for Wi-Fi and you don’t want to waste half your holiday looking for a free Wi-Fi cafe. Most departure fees are included in your plane ticket, but not all! There are quite a few countries that charge a departure fee including Hong Kong, Cambodia, Costa Rica and Columbia, even if you it is not your final destination. These fees may add up quickly, especially if you are travelling to a number of places. Find out from the airline that you are travelling with if there is any departure fees associated with your flights. Many countries, such as St Lucia, will require you to have a temporary driver’s license if you wish to drive in the country. These can cost you a small amount, so it is worth bearing in mind before you travel. Enquiring with the airline or through the embassy of the country you are travelling to will give you the information you need about any costs associated with temporary driver’s licenses dizi fragmanları. To save even more money on your travels take a look at these money saving travel accessories.